I got home off the road on a cold rainy Sunday morning to find our house all decorated for my favorite time of the year, the season we set aside to celebrate the birth of Jesus Christ, Son of Almighty God, Prince of Peace, King of Kings, Lord of Lords, The Way The Truth, The Life and Savior of mankind. At my house and at untold millions of houses across America and the world, Jesus is the reason for the season, but in the offices of the American Civil Liberties Union, and the enclaves of humanist’s atheists and other non-Christian faiths, it is just another day, which is their prerogative. The federal papers our forefathers drew up guarantee freedom of religion, which means you can worship a snail if you so desire or deny there is any deity at all if that is your choice. These people who choose to follow another path can celebrate their holidays with impunity and without interference from me and the vast majority of the Christian community, and as lost as we feel they are, we do not interfere in their Earth Days, Wiccan ceremonies, Summer Solstice celebrations and other public manifestations of their beliefs. But live and let live does not seem to be acceptable to this bunch, they want every symbol of Christmas removed from every public place in the land, they don't want Christmas Pageants or the singing of Christmas Carols in public schools, Nativity Scenes banned from public sight and have intimidated merchants to the point that they forbid their employees to say Merry Christmas to their customers. I, for one, will never give in to this movement; I refuse to say Happy Holidays or Seasons Greetings or any of the other neutral inanities that could be used to describe any other holiday of the year. No Sir! It’s all about Jesus and I will say Merry Christmas and respect the true meaning and traditions of Christmas if it drives the ACLU into apoplexy and infuriates every atheist on the face of the planet, anything else is lukewarm in my book. I will not bow down to political correctness nor be intimidated by the supposed intellectual elite who deem themselves wiser than the God who created them. Let's just apply a little cowboy logic to the situation. Hence a day set aside to commemorate the birth of Christ - Christmas, with all the symbolism and accouterments afforded other holidays. Halloween’s earliest origins were from pagan religions, which the ACLU seems to have no trouble at all with. People could set jack-o’- lanterns on the Capitol steps and they wouldn't mind, but one Nativity Scene on the courthouse grounds of the smallest city in America means lawsuits. Does seeing a baby lying in a manger surrounded by barnyard animals threaten the religious freedom of America? Does the singing of Christmas Carols on public property constitute a danger to the rights of other religions to practice their faith? Is the phrase, "Merry Christmas" really so offensive? Actually, when you stop and think about it, it's all really silly. This nation has survived over two hundred years of Christmases and should the world last that long, when the wind and rain has washed the last vestiges of the names of those who so vehemently oppose It off their headstones, Christmas will still be celebrated. Correct on every point. 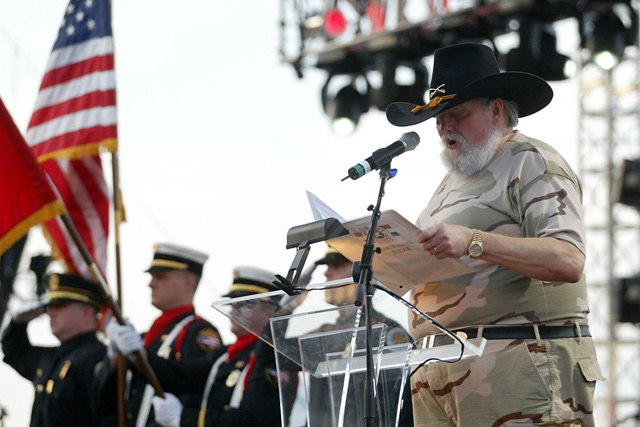 God bless you Charlie Daniels for speaking the truth!! !